Sunday the 13th of May will mark the 450th Anniversary of the “Battle of Langside”. Fought in 1568, this was the most significant battle within the boundaries of Glasgow. 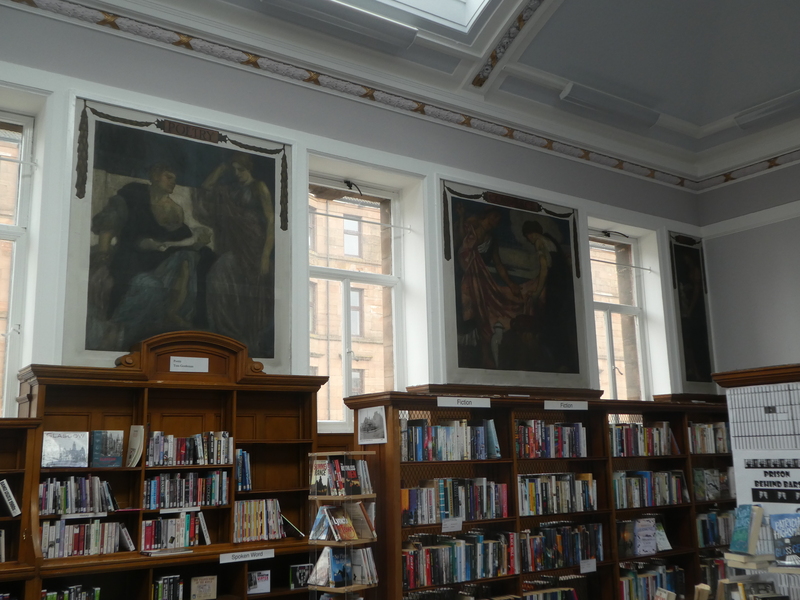 In 1921, it became the subject of a large mural in Langside Library, which was painted by Maurice Greiffenhagen. 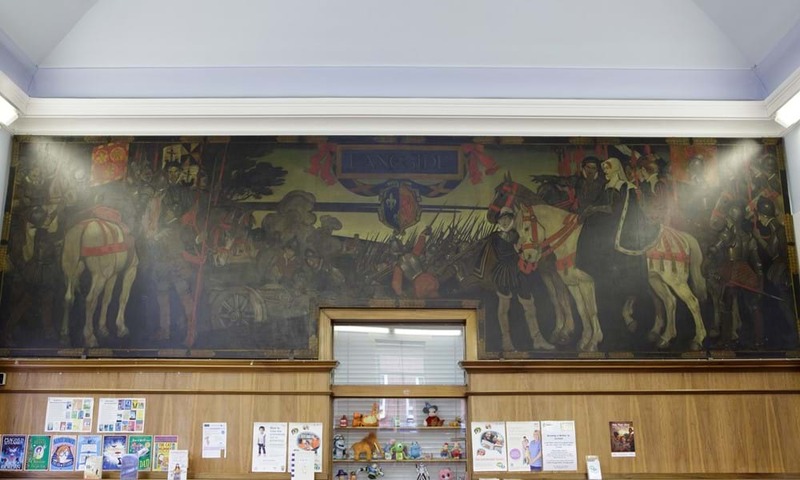 “Battle of Langside” mural in Langside Library. Image courtesy of Glasgow Life. The battle occurred as a result of a series of events which forced Mary Queen of Scots to abdicate in favour of her infant son James. On the morning of the 13th of May 1568, forces in support of the Queen marched from Hamilton to Dumbarton Castle where troops commanded by the Regent Moray blocked their path. After an unsuccessful cavalry charge, Mary’s foot soldiers approached Langside Hill. The two armies clashed in the area where Battlefield Memorial now stands. Reinforcements on the Regent’s side attached the Queen’s troops in the flank and they were forced to withdraw. It was estimated that 300 were killed on the Queen’s side whereas only a few died in the Regent’s army. The Queen fled south after the battle, spending her last night in Scotland in Dundrennan Abbey before crossing the English border where she faced captivity before being executed. Many years later in the early 20th century, there was an initiative by the City of Glasgow Cooperation for staff and students at The Glasgow School of Art to contribute to the decoration of public buildings. Two murals were commissioned for this scheme; one for Possilpark Library and the one in question for Langside library. Although the Possilpark mural was completed in 1914, the outbreak of war delayed the Langside one from being completed until 1921. Possilpark Library Panels – shown are “Poetry” by Tom Gentleman and “Commerce” by Robertson Weir. Click here for a video with more information. As with the majority of GSA’s history, the Archives and Collections contains references to these murals within our institutional collection, which you can find here on our online catalogue. One such piece of material is a letter from the School’s Director Francis Newbery to the Town Clerk John Lindsay dated 12th June 1914 (GSAA/DIR/5/24). 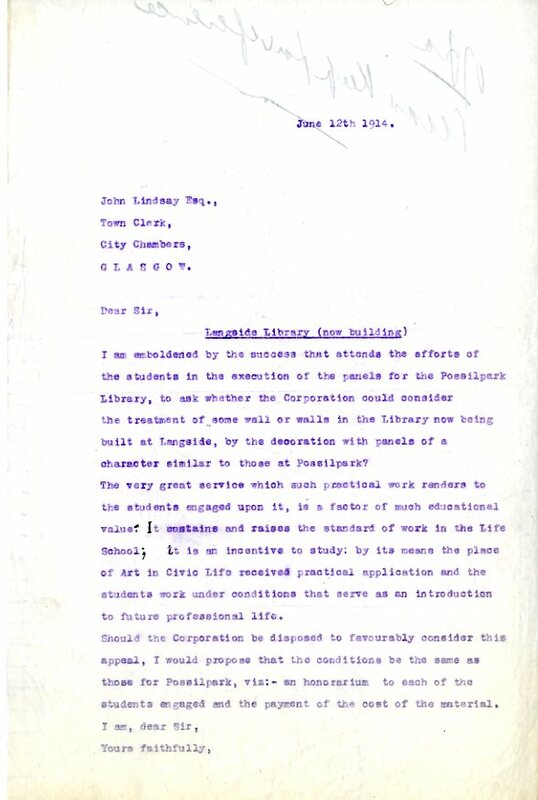 In the letter, Newbery praises the efforts of the students involved in the Possilpark Library murals and tries to secure an opportunity for a similar project in Langside Library, which at that time was just being built. Newbery talks about how these opportunities offer “much education value” and that this work “sustains and raises the standard of work in the Life School”, providing an insight into his beliefs about extra-curricular student activity! You can read about Francis Newbery’s time at the School in a previous blog post by our Cataloguing Project Archivist Rachael Jones here. In celebration of the battle’s anniversary, Glasgow’s south side will host a number of free events for the whole family in Queen’s Park on the 12th and 13th of May. If you are interested in investigating the story further, why not make an appointment to come in and view our institutional collection for yourself? You can do this by emailing archives@gsa.ac.uk or telephoning 0141 566 1418. The Flower and the Green Leaf by Ray McKenzie.